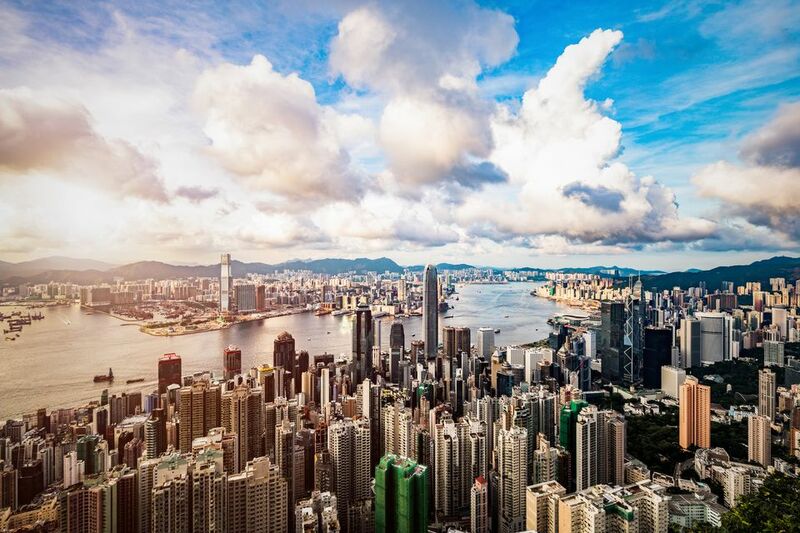 Hong Kong’s cityscape is, without ​a doubt, the best in the world. The thousands of skyscrapers crammed around Victoria Harbour have graced a thousand magazine covers and lit up dozens of guidebooks and you can expect your camera to be loaded with the bright lights of the skyline before you leave. Below we’ll tell you how to get that classic harbor front photo. But the treats for your camera don’t stop with the skyscrapers. The city streets are equally impressive; from brightly colored markets to the distinctive neon signs that give the city it’s Bladerunner-like glow. This is simple. There are dozens of ways to get your eyes on the skyline but the simplest remains the best. The classic photo is taken from the Avenue of Stars in Kowloon. This offers a direct line of sight onto the full spread of skyscrapers across the water. The key buildings and skyscrapers are all clustered together so it won’t be too difficult to get them all in the shot. It’s also a handy spot to set up a shot. There is plenty of room, which allows you time to get the picture just right. The skyline definitely looks better by night so if you have a decent DSLR it’s worth taking your picture after the sun has gone down. Hong Kong is home to the most crowded city districts in the world. That’s what happens when you build a city ​into the side of a rock and then cram millions of people into it. But with so much life happening on the street there are some fantastic photos up for grabs. One of the best places to see Hong Kong at its liveliest is in Mongkok. Packed with markets, street food stalls, and people, the district hums with life, especially after work. Head for Shan Tung street; where you’ll find streets stacked with humanity, including the Ladies Market, and plenty of opportunities to grab some colorful photos. Most photographed after the cityscape, Hong Kong’s iconic neon advertising signs still light up the city after dark. Hung in every building and from every angle they offer brilliant lighting to any nighttime street scene. You’ll be spoilt for choice when it comes to the best street to get a snap of the signs, but there are a couple of top tips. No street has more signs than Nathan Road and it’s the street that features in most of the famous photos. For something more intimate, head for the streets around Jordan or Causeway Bay – the smaller streets are packed with shops and signs. You can even pick a street by looking up the Neon Signs nostalgia page. Of course, it can’t all be about the city. Hong Kong has some fantastic countryside to explore and there are plenty of places to fill up your photo album. To get a panoramic the lush landscape head for Lantau and the Big Buddha. From the top of the hill, you’ll get a birdseye view of the jungle-like greenery across the mountains and the shimmering South China Sea. Elsewhere, there are some especially arresting pictures to make folks back home envious of your holiday snaps. Staying on Lantau, the stilt houses set over mud flats in Tai O are impressive, while the mangroves at Hong Kong Wetland Park offer the patient photographer the chance to get a snap of local wildlife.